My first dive with Dive and Sea Tenerife was at Abades 1st reef, and on Sunday I finished off with style in just the same place! Abades is one of the better exploration dive sites in Tenerife, it is endless what the reef can share if you look really close! I’m going to miss everybody and I am very thankful for the opportunity. Randall did a good job bringing me from PADI Advanced diver to Divemaster! And I learned so much from Flounder and I am very impressed by his endless patience teaching me the mask clearing skill! And the other interns, Steve and Alan, THE Americans! We had so much fun! And sweet Starfish, I will see you in Singapore! I’m ready for the Tempura Shrimps! I’m going to miss all of my nicknames, Ollie, Thor and Olivos. Going back to Karoline is going to be a bit boring. Ciao, Adios, Hadebra and Byebye! 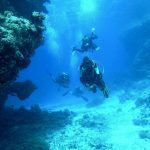 Tagged: Diving in Tenerife, Diving Tenerife, PADI Divemaster internship Tenerife, Special Offers Diving, Tenerife Dive Sites.